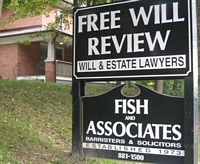 Both Barry M. Fish and Les Kotzer are Wills and Estates lawyers who have been practicing for many years in the law firm of Fish & Associates, located in Thornhill, ON. Barry graduated with a Bachelor of Laws Degree from McGill University in 1969. He was called as a member of the Bar of the Province of Ontario in 1972. Barry started the Law Firm of Fish & Associates in 1973. Les graduated, on the Dean's honour roll, with a Bachelor of Laws Degree from University of Windsor Law in 1987. He was called as a member of the Bar of the Province of Ontario in 1989. Les joined the Law Firm of Fish & Associates in 1989. Both Les and Barry have been featured in numerous newspaper and magazine articles and have appeared as guests on many radio and television shows. They are often invited to give seminars and talks to the public and to various trade and professional organizations. In The Family Fight... Planning to avoid it, Barry Fish and Les Kotzer, provide insight and strategies to help you plan your estate in a way that will avoid inheritance disputes amongst your family members. All this is done using a plain language, "tell it like it is" approach. In 2006 Barry Fish and Les Kotzer co-authored a book entitled The Family War... Winning the Inheritance Battle, with Wills and Estates Specialist Jordan Atin. In 2009 Barry and Les Co-Authored Where There's an Inheritance...Stories from Inside the World of Two Wills Lawyers. In 2014 Barry and Les released a fourth book entitled The Wills Lawyers... Their Stories of Money, Inheritance, Family, Greed and Betrayal. The Family Fight... Planning to avoid it, has been featured in Time Magazine, The L.A. Times, The Boston Herald, The Toronto Star, Newsweek, The New York Times, The Washington Post, The National Post, Associated Press and other publications. 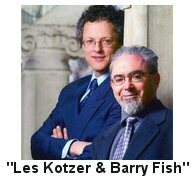 Barry Fish and Les Kotzer are frequent guests on television and radio programs across North America. They have appeared on CNN, Fox, CityTV, Zoomer Radio, National Public Radio and many other programs. They have also been featured in publications such as Time, Newsweek, Fortune, Good Housekeeping, The New York Times, The Wallstreet Journal, USA Today, The National Post... and many more. The Family Fight... Planning to avoid it. June 1973Fish & Associates Professional Corporation was founded by Barry M. Fish, B.A. B.C.L. LL.B. Dec. 1974Fish & Associates moved their offices to a new location 1/4 mile north of their current location, also on the east side of Yonge Street, at 8131 Yonge Street. 1989 Fish & Associates was joined by Les Kotzer, B.A. (Hons. ), LL.B. 2002Barry and Les Co-Authored The Family Fight... Planning to Avoid it. 2006Barry and Les Co-Authored The Family War... Winning the Inheritance Battle with Jordan M. Atin. 2009Barry and Les Co-Authored Where There's an Inheritance...Stories from Inside the World of Two Wills Lawyers. 2014Barry and Les Co-Authored THE WILLS LAWYERS... Their Stories of Money, Inheritance, Greed, Family and Betrayal.